A gift set for revolutionary people and times, reflective of our colonial culture. Celebrating the rebellious spirit in everyone. 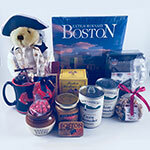 Contains items reminiscent of life in the original New England colonies, including items and snacks related to the era. Patriot Teddy Bear. George is our cute 10� tall Boston teddy bear. He is clad in a meticulously-detailed colonial patriot outfit. With premium eyes, hand-stitched nose and mouth, and high quality fur. Made by Herrington Teddy Bears. Freedom Trail Book. The Freedom Trail wends its way back into history along a route traveled by Puritans, Patriots, and generations since. This book, illustrated with wonderful large photographs by Steve Dunwell, describes each of the sixteen sites along the historic trail. 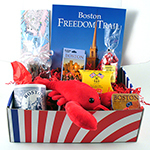 Learn about the old State House, Faneuil Hall, Old South Meeting House, Old Ironsides, Bunker Hill, Paul Revere's House, The Boston Massacre, Granary Burying Ground and many more. Wintergreen Patties. 8 ounces of Wintergreen Patties by Ye Olde Pepper Companie are handmade the old fashioned way, using original recipes dating back over a hundred years. The candy starts with only the finest ingredients, all cooked in small batches in copper kettles over open-fired gas stoves. The wintergreen patties are handmade in the Ye Olde Pepper Companie kitchen and for many years have been acclaimed for their superior quality and rich taste the world over. Fruit-Sweetened Dried Cranberries. A clear, clean taste, less sweet than our cane-sugar version and a noticeable cranberry tang! No fructose or sucrose. Will be a taste point in many baking products. Recognized for their health benefits, cranberries have been recommended for prevention and alleviation of kidney and urinary-tract infections. Bags measure about 3 inches x 5 inches. They are marked as 3.53 oz, but generally contain 4-5 ounces of cranberries. Boston Baked Beans Candy in Crock. Peanuts panned with a hard candy cover, look just like the real ones. A traditional New England treat. Eight ounces of candy in a ceramic crock pot, all sealed in cellophane. The crocks are approximately 3 1/2" in diameter and 3" tall. Gummy Lobsters. Boston Gummi Lobsters in a 7 oz clear bag with ribbon. Each bag contains about 21 lobsters. Boston Harbor Tea. Boston Harbour Tea by Davison Newman & Company Ltd., founded in 1650 and whose Fine Tea was thrown into the water of Boston Harbour by Persons disguised as Indians in defiance of the Policies of His Majesty King George III 1773-1774. 4 ounce bar of New England Lobstah soap. 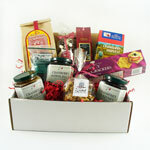 Each Massachusetts gourmet gift assortment is attractively packaged in a white gift box (11.5" x 16" x 4" ) which is delicately packed in a shipping carton. 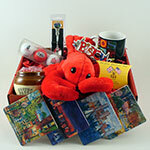 Specify a gift message and we will include a gift card at no charge. Optional gift wrapping is available.